MANAGING ABROAD CAN be difficult for British managers. The main obstacle cited is having to learn a new language to communicate with the players. Not so for David Moyes. During his spell in charge of Real Sociedad, he channeled his “inner Steve McClaren”, showing that learning the local lingo was not a problem for him. End of season awards are often drab affairs, apart for those involved, nobody really remembers them. Cue, Louis Van Gaal. 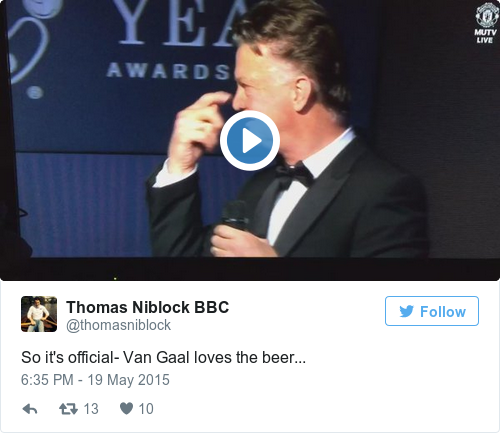 The Dutchman took to the stage to rally his players for next season. Somehow, I think the message was lost…. In July, British prankster Lee Nelson forced FIFA President, Sepp Blatter to put a temporary halt to his press conference, by throwing money at him, following his alleged involvement in corruption at FIFA. When the news broke that Brendan Rodgers had been sacked by Liverpool, Thierry Henry provided us with a priceless reaction, while at the same time instantly comforting Jamie Carragher, who found the situation a little awkward. After Northern Ireland secured their place in the European Championship’s for the first time, Kyle Lafferty decided to have a bit of fun with a Sky Sports News reporter, when asked which team he wanted Northern Ireland to draw in France. We all know the Swede is not the shy, retiring type. Earlier this year, he claimed his goalscoring form had put the French league on the map. When he came up against Saint-Etienne’s Paul Baysse, the Swede had to check the back of his shirt for his opponent’s name, claiming he didn’t know who he was. When Baysse, retaliated with the same gesture, Zlatan was shocked. Back to Manchester United’s award night. When Ryan Giggs played for Manchester United they would play to the final whistle, something that Louis Van Gaal’s have failed to replicate. During the charity auction, Ryan Giggs nipped in the very end to take the prize away from Van Gaal, putting an end to his premature celebration. Ryan was just lucky it wasn’t’ his brother. Email “It's a funny ol' game: 8 football moments from 2015 guaranteed to give you a laugh ”. Feedback on “It's a funny ol' game: 8 football moments from 2015 guaranteed to give you a laugh ”.